This is a sponsored post on behalf of Sam’s Club. All opinions are my own. One thing I miss from before we had a baby was spontaneity. Seeing a movie on a weeknight at 9 PM just because, deciding on a whim to head to Austin for a weekend getaway, or a fun and fancy dinner out with friends. Now to make plans with friends it requires months of planning, coordinating schedules, booking babysitters, and praying no one gets sick! With very active kids, it gets increasingly more difficult for our couple friends to go out for dinner! To make matters worse, a night out means you’re paying for the meal AND the sitter! So basically, you are paying twice as much and you feel rushed. That’s why I’m throwing a dinner party for our fellow parents of toddlers with the help of Sam’s Club. They’ve got everything you need for an intimate, fun and much needed “night out” at the house! 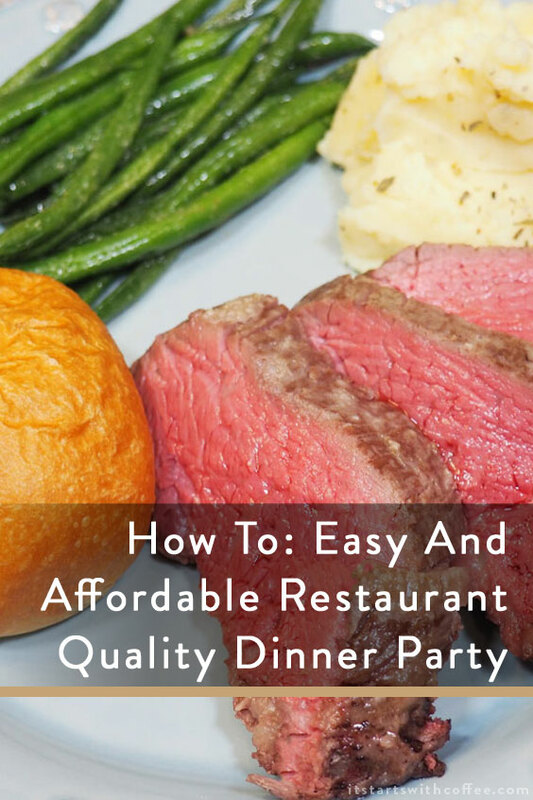 Plus, it’s an easy and affordable restaurant quality dinner in the comfort of your home. We already shop at Sam’s Club every Saturday. Seriously, you can usually find us in the snack area. So it was pretty easy to get what we needed plus our usual groceries. 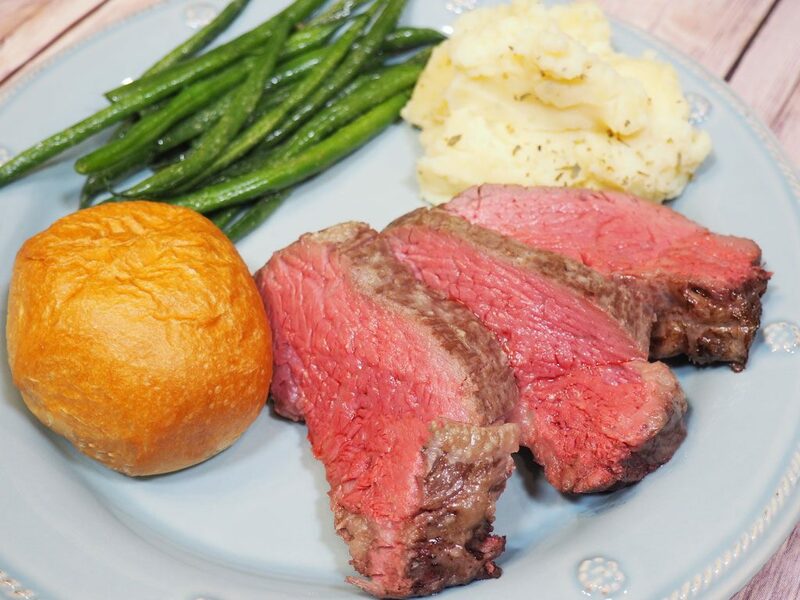 Sam’s Club has USDA Prime Beef and everything else you need for the sides. We decided for this to go with Prime Tenderloin, mashed potatoes, green beans, and rolls. 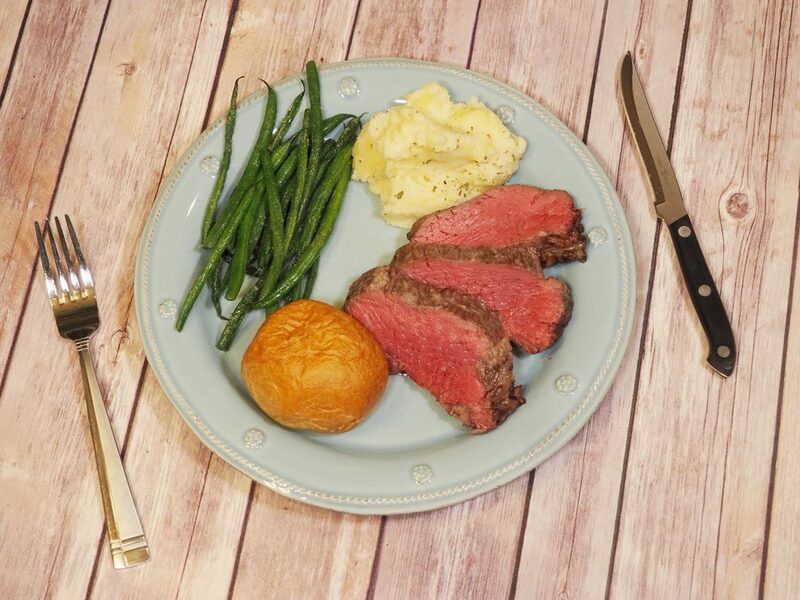 Prime Beef is the highest USDA graded beef available in the marketplace (better than Select or Choice); less than 10% of beef in the US qualifies as USDA Prime grade. Plus the price was amazing! Sam’s Club provides members with an amazing value to competition. This was a huge factor for us. I mean if we are making restaurant quality dinner you have to have steak. Let me tell you how incredible they were. It was SO HARD to not want to just grab a giant spoon and eat all of the mashed potatoes myself in a corner. I kid. The quality was so good I was shocked that they were microwaved! 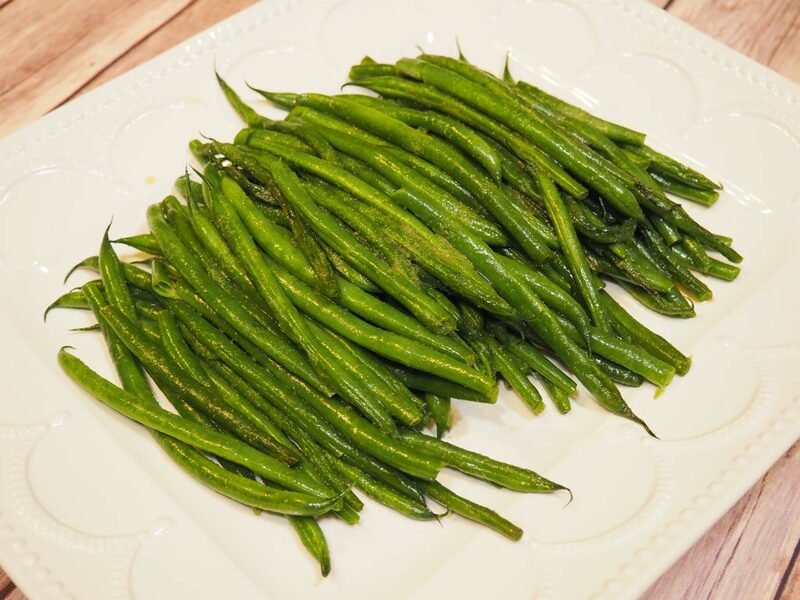 Also the green beans were some of the best I have ever had. 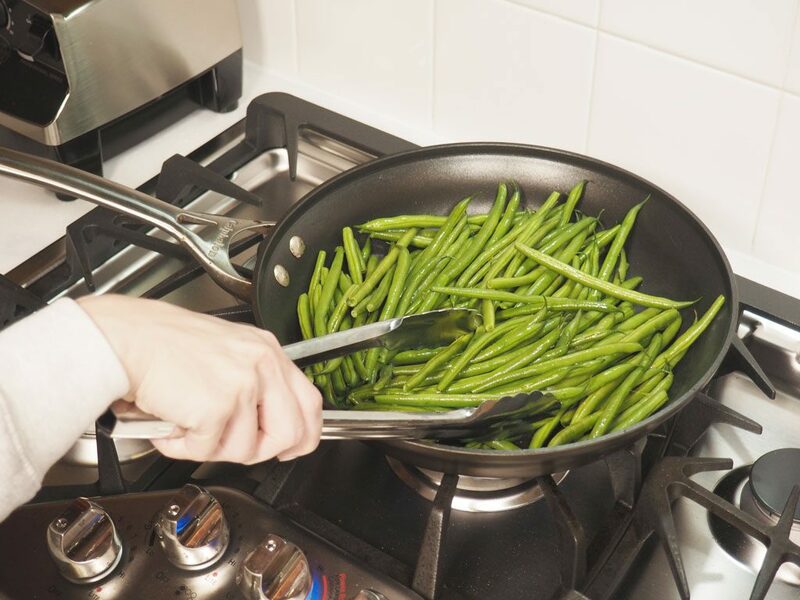 Green beans have always been one of my favorite veggies so I am pretty picky about them. The rolls when heated were so soft and melt in your mouth good! We also picked up some STUNNING flowers to add a little something extra to the set up! As I said, knowing our friends, we wanted to make things that pretty much everyone loves. Everyone could NOT get over how delicious the food was and was shocked that it was all purchased so easily at Sam’s Club. 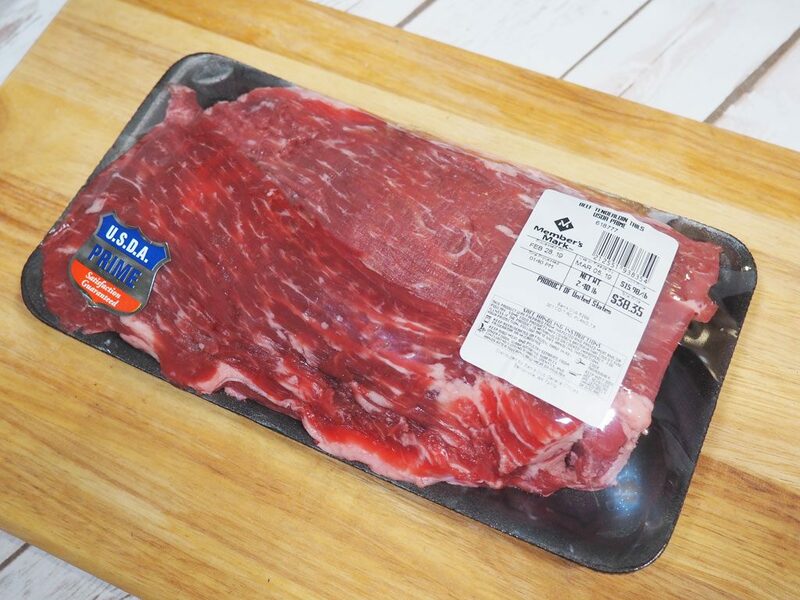 You can get any of your favorite grilling cuts of USDA Prime beef at all Sam’s Club locations – Ribeyes, NY Strips, Tenderloin Filets, Sirloins, and Briskets. 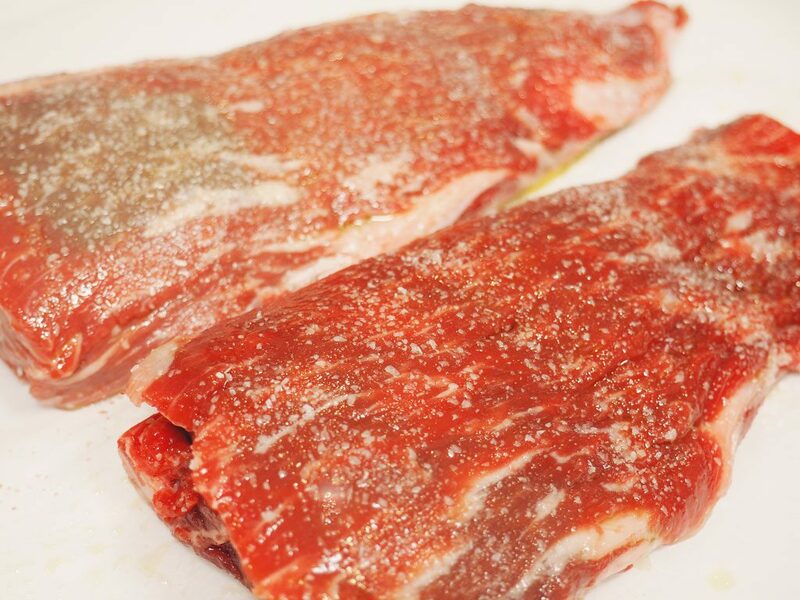 Because of the amazing quality, marbling and tenderness of USDA Prime Beef, very little prep is needed – just oil, salt and pepper. Sear then grill to your preferred doneness. When something is this good, you don’t have to work very hard to make it taste amazing. We like low maintenance food here. This is for sure where we will be going for our USDA prime beef from now on. Not to mention so many choices for amazing side dishes. We can’t wait to try more! Not only does Sam’s Club have amazing food, but we even got some gorgeous flowers. 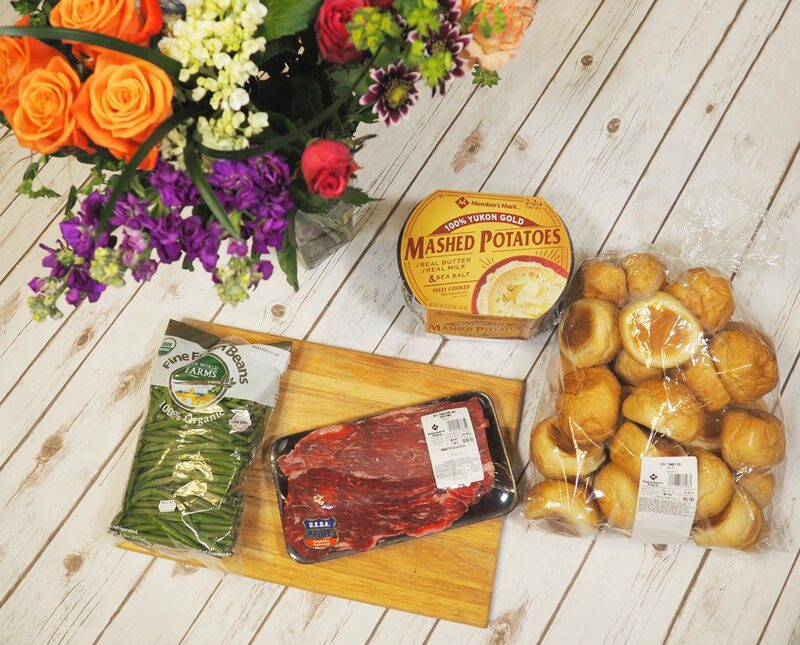 You can come to Sam’s Club for all the spring things from delicious ready-made essentials to plates, decor, and flowers. So much more! It really is a one stop shop for all entertaining! Some bonuses of shopping at Sam’s Club include the Scan & Go feature. You can use this feature on the Sam’s Club App to scan items as you shop and pay straight from your phone. No need to stand in the checkout lines! I suggest it especially with toddlers in tow. We know how temperamental they can be. Another great thing you can do is to use Club Pickup – order ahead online and Sam’s Club associates will have items ready when you arrive. I love anywhere I can do this! When kiddos are acting crazy and you don’t want to get out of the car you don’t have to worry. This night was SO fun because kiddos could easily play upstairs (or sleep in Liam’s case) and parents could enjoy a restaurant quality meal without worrying about rushing home to pay a sitter. The best of both worlds for everyone. Plus, no fancy dress codes 🙂 From start to finish the entire experience was easy and fun! 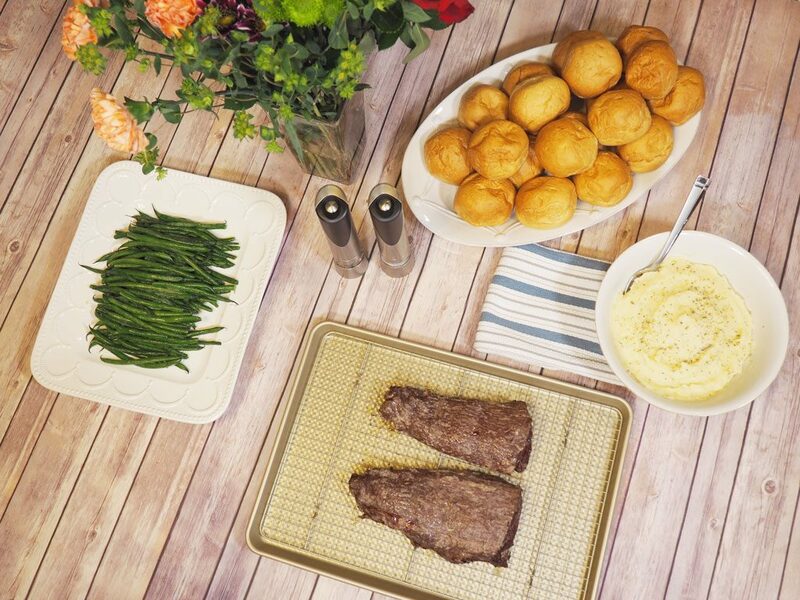 It was a blast cooking for our friends and having this amazing meal and the ease of shopping somewhere we trust for so many delicious options is priceless. How do you make date nights or nights out with friends easily accessible? This looks delicious, Neely! It’s so healthy and clean too. I wish I had space in my apartment to have friends over for dinner too! We have “movie club” at our house once a month. Our friends bring their kids and they all hang out while the adults get to hang out. We make more food than we need and have a great time. No one has to pay for a sitter and we get to spend time with friends. It’s a perfect compromise! 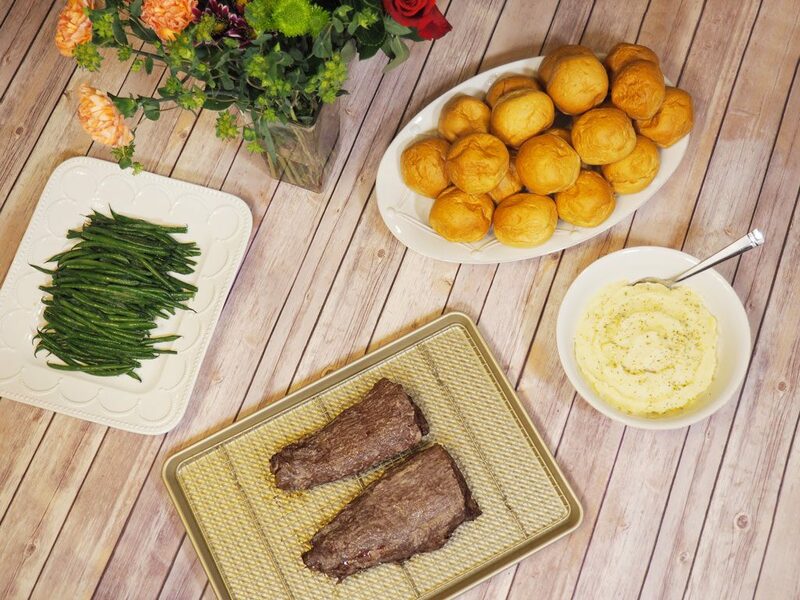 Great dinner party meal idea… we definitely need to invite some friends over to eat soon! This plate is calling my name and makes me so hungry. 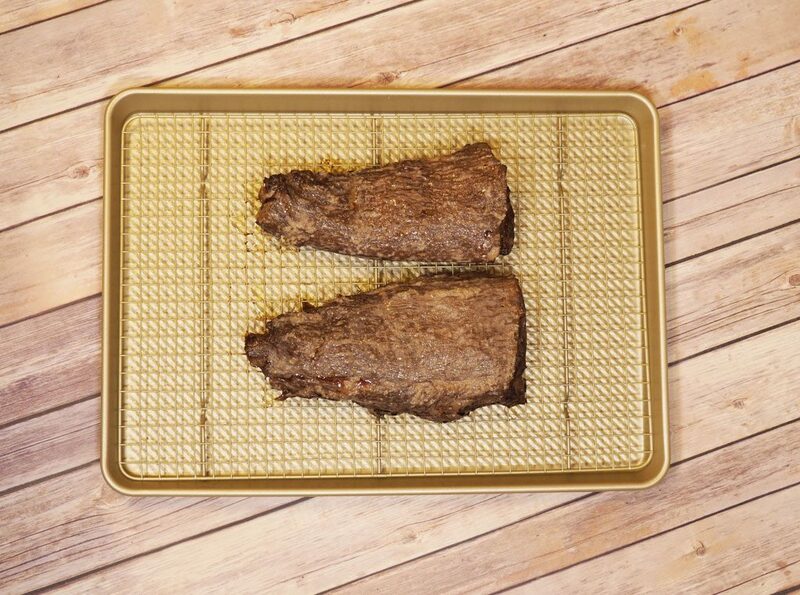 All I need right now is to have that steak. This looks so good and fancy! When we have people over, we BBQ. So much easier and don’t have to be clean because BBQ is suppose to be messy. lol I love your pictures too by the way! Ooooo love it!!! I used to host so many dinner parties back when I actually had friends lol…. you can have a fabulous menu and have it not break the bank! LOVE this! We don’t have Sam’s Club near us (we have one of their competitors instead) but it is a running joke among my husband’s colleagues that whenever someone throws a dinner party, the hosts will probably have stocked up at said club warehouse to pull it off! So easy AND so tasty!!! This is super yummy and I really enjoy your tips! This is great! I have never shopped in Sam’s Club because we don’t have it here, but sounds awesome place for buying fresh healthy food stuff. Those beautiful food pictures just made me hungry! All of this food looks like it would be so good. I have never really made anything like this for a dinner party before.